The Lockhaven Diner Booth (Model LH-2-LSB) represents a fully upholstered booth featuring a vertical channel tufting on 7″ centers and 36″ overall height, with laminated top cap, end panels and sub base. Available in your choice of standard and designer vinyls. Optional top and side wood caps available. Call for pricing. 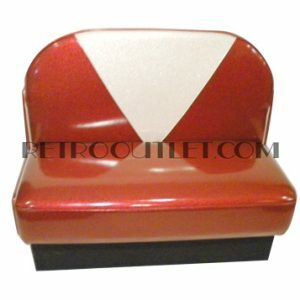 Please allow 4-5 weeks for production of the Lockhaven Diner Booth in your choice of colors.